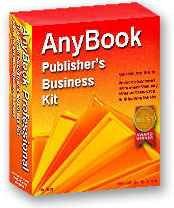 Below is AnyBook's Main Screen. This is where everything begins. The screen is basically an electronic invoice form on which you enter orders as you receive them. The Main Screen is also the starting point from which you can access all other parts of the program: inventory information, billing statements, customer and product information, royalty functions, purchase orders, mailing lists, etc. Pop-up Lists. There are all sorts of handy features built in this part of the program. You can click the "L" button or double click in the Bill-to blank and bring up a list of all of your past customers. Select the one you want, and the customer's name and address are automatically entered for you, saving you typing time. You can also bring up a pop-up list of frequent customers with a customer number. (Unlike most publishing systems, you don't have to assign numbers to all customers, only regular customers.) The same feature is available for products. Click on the "Add" button to bring up a list of products--or click on the "Toggle" button to access a different type of product entry screen. Handy Features. The program will figure discounts and do all the calculations. You can write notes to yourself in the notes area. It allows you to keep track of returns, promotional books, damages, consigned goods and back orders. You can also lock invoices, if desired, to prevent inadvertent changes. Tracking Payments. It's easy to keep track of which invoices are paid since payments are entered directly on the invoice itself. A special automatic payment feature (called the Mark Paid feature) is available to help make the recording of payments easier. What's so nice about the Main Screen is that so much information is available in one place. You don't have to go searching around the program. All primary data dealing with orders, products, customers and payments are consolidated. Multi-tasking. When other information is needed, such as a billing statement or an inventory record, the Main Screen stays visible while other windows overlay it. You can move from window to window, making comparisons and extracting needed information without having to close and re-open different parts of the program. More on Pop-up Lists. Have we emphasized how useful the pop-up lists are? Probably, but you'll have to excuse our enthusiasm. We're pretty proud of the work that's gone into them. Below, we've reproduced the pop-up list of products. This is activated by clicking on the "Add" button on the Main Invoice Screen. You select the product you want, and it's automatically entered on the Main Invoice Screen. The version below is a shortened list, but you can expand the list to full size. There's all sorts of ways of quickly locating products. You can even check the latest inventory level of a product by clicking on the "Inventory" button. Entering products has never been easier!